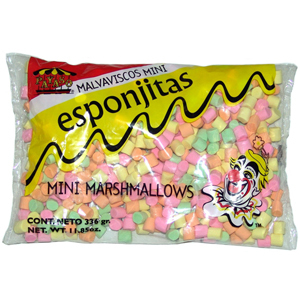 Payaso Malvaviscos "Esponjitas" Marshmallows Mini re a great product for your enjoyment. Mini portions of white and pink marshmallows for your favorite uses. A Great Product, Great Quality and all behind the great smile of Payaso. Enjoy. Quality and freshness guaranteed.